Breathe easy and enjoy the outdoors again. 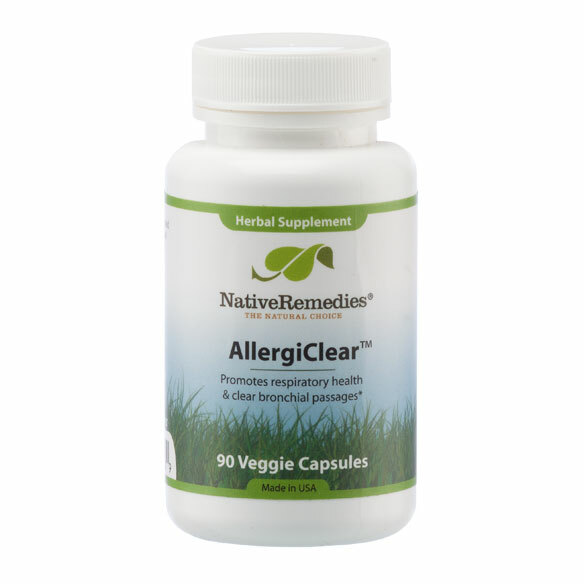 NativeRemedies® AllergiClear™ herbal supplement supports healthy sinuses, clear eyes and normal histamine levels — without medication side effects. This allergy supplement helps maintain a healthy immune system to ward off harmful airborne substances, such as dust, pollen, plant spores and chemical pollutants. Herbal allergy relief helps soothe mucous membranes. 90 capsules last approx. 3 weeks. Quercetin is a well-known flavonoid that is usually found mostly in onions and apples and is considered to be a 'building block' for other flavonoids. Flavonoids are important and powerful antioxidants found in fruits, vegetables and herbs and can also reduce inflammation, boost immunity, strengthen blood vessels and improve circulation. Quercetin is known for its ability to block the release of histamine, thereby preventing allergy symptoms like swollen nasal passages, congestion, sneezing, watery eyes and itchiness in the eyes and nose. Eyebright (Euphrasia officinalis) has been used since the Middle Ages to reduce eye inflammations. It may be used topically but is very beneficial when taken internally to reduce watery, painful and itchy eyes. Other benefits include the maintenance of good vision and eye health. How do I use AllergiClear-S? Adults & Children 12+: Take 2 capsules 2 times daily. Children 6-12: Take 1 capsule 2 times daily.